The Muséum national d'Histoire naturelle (MNHN) (National Museum of Natural History) was formally founded on June 10, 1783, during the French Revolution. Its origins lie, however, in the Jardin royal des plantes médicinales (Royal Medicinal Plant Garden) created by King Louis XIII in 1635, which wasrun by the royal physicians, Guy de La Brosse and Jean Herouard. The royal proclamation of the boy-king Louis XV in 1718, removed the medical function, enabling the garden, which became known simply as the Jardin du Roi (King's Garden), to focus on natural history. For much of the 18th century (1739–1788), the garden was under the direction of Georges-Louis Leclerc, Comte de Buffon, one of the leading naturalists of the Enlightenment, bringing international fame and prestige to the establishment. 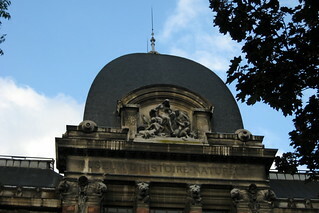 Incorporated as the Muséum national d'Histoire naturelle in 1793, opening in 1794 with, as one of its foundation professors, eminent evolutionary pioneer Jean-Baptiste de Lamarck, it continued to flourish over the next century, and, particularly under the direction of chemist Michel Eugène Chevreul, became a rival to the University of Paris in scientific research. The museum includes sites throughout France, including this original location at the Jardin des Plantes, which houses the Gallery of Mineralogy and Geology, the Gallery of Palaeontology and Comparative Anatomy, and the famous Grand Gallery of Evolution (Grande Galerie de l'évolution). The museum's Menagerie is also located in the garden.